Just a few weeks ago it seemed like a foregone conclusion that Wayne Simmonds would be changing his number soon. 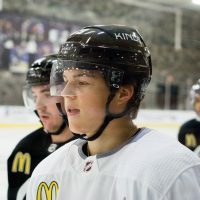 All signs pointed to the Kings signing some Russian winger who scores a lot of goals. That didn’t happen. He, sorta, went to the Devils. Meanwhile, Simmonds, who just completed his second season in Los Angeles, found himself on the cover of The Hockey News this week. 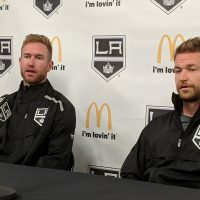 The magazine’s article was supplemented online with a video conversation held with Simmonds and the Avs’ Chris Stewart, who apparently share a home together in the off-season. A secondary article on the site focuses on their agent, Eustace King, the first and only African-American agent representing NHL players. In the past, Wayne the Train has been linked to Willie O’Ree – the first player to cross the NHL’s color barrier back in 1958. He even read from O’Ree’s autobiography for some children visiting the NHL store in New York last year. Here though, the focus was on two stars of the future, rather than the past. 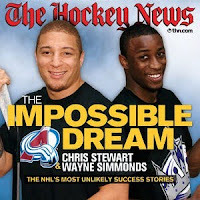 Stewart and Simmonds are a few of the current poster boys for minorities in hockey…or as the NHL calls it, Hockey is for Everyone. Wayne’s story isn’t just about the color of his skin, it’s more about being a hockey player. This sport is expensive and many parents can’t afford to buy the gear necessary for their children to participate – regardless of being black, white or brown. The Simmonds family found a way to overcome those obstacles and Wayne has repaid them with an ever-growing passion for the game. His play on the ice continues to improve as well. Simmonds followed up a strong rookie year by tying for the team lead in goals during the preseason last September – just barely losing out to Anze Kopitar for the first Eddie Joyal Award. His exceptional play over the next few months didn’t go unnoticed by Coach Terry Murray either. When Justin Williams went down with the dreaded “lower body injury,” Simmonds was pushed up to the top line with Ryan Smyth and Kopitar. He more than held his own, scoring a few goals in the five games Williams missed. 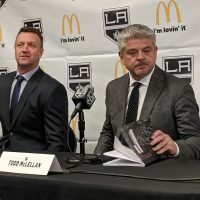 Off the ice, the Kings recognized Simmonds growing popularity among fans and honored him with a bobblehead giveaway…the first ever for an active member of the team. His character and work ethic are often two things coaches, scouts and teammates point to when asking for thoughts about The Train. Dave Torrie, his former GM in junior hockey, certainly agrees. After all, he traded away a player and two second round draft picks for Simmonds when the Greyhounds were trying to make a playoff run in the 2007-08 season. Simmonds had 14 points (5g, 9a) in 14 playoff games that year for the Soo. 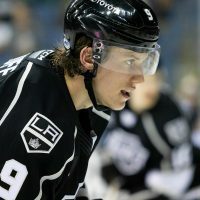 And that was it, he never returned after being ‘the surprise of camp’ that fall and sticking with the Kings. 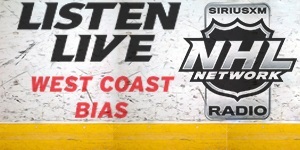 That’s probably why just about every GM that Dean Lombardi talks to lately inquires about his availability. Wayne The Train is a hot commodity these days.